A dish that can pass as a savory cold salad or a hot rice dish - either way, it's delicious! This rice and nut salad recipe is a really versatile one. It can serve as a hot rice dish, but we use it as a savory, cold salad. Either way, it is a delicious dish that you can make ahead and serve as a side or take it hot off the stove, mix it up and serve it warm as part of your main course. You can also serve it with other types of nuts. If you don't like walnuts, use pecans for example. The rice and nut salad is equally delicious no matter what type of nut you include. Cook the rice according to package directions. Refrigerate for at least two hours (best if over night). This removes some of the moisture. Heat oil in a medium skillet and saute the onion until soft but not brown. Add the tomato puree, mint, allspice and cumin Let stand until cooled to room temperature. 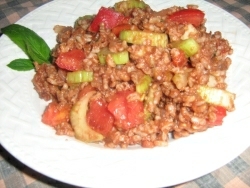 Stir in the walnuts and rice. Add the lemon juice and mix thoroughly. Let stand for at least 30 minutes to meld the flavors. Add the chopped veggies and toss gently just prior to serving.